The world can be a dangerous place, especially for people with dementia. But could looking for dementia dangers actually help to make us all a little safer? It was more an instinct than a smell, a faint warning at the back of my brain. But now I’d registered the thought, I’d lost the concentration for writing. Yes, surely that was something burning. A little stronger now. But it couldn’t possibly be in the house. I’d been sitting here at the computer for the past hour ever since we’d grabbed a sandwich for lunch. I hadn’t left anything turned on, I was sure. Wasn’t I? Yes, I was. Anyway, if it was inside, the smoke alarm would be bleeping its heart out. Thanks to the ingenuity of our electrician, just making a slice of toast always triggers the alarm. Where was Lena? I couldn’t hear her. Probably dozing in front of the TV, just like she always does after lunch. No mistaking that smell now. I stood up and went to the window. Was it something outside? Nothing I could see. Better go check. I bounded downstairs. Nothing in the front room – except Lena. She grinned up at me through half-closed eyes. – Can you smell burning? – What? Vad säger du? – Let’s go and see. Through the dining room and into the kitchen … and there it was. On the glass top of the cooker sat the loaf of bread I’d left there since lunchtime. The burning smell was from the plastic wrapper, melting into the glass. What the hell …? As I yanked it away, the plastic tried to cling to the glass, like chewing-gum. At the bottom of the pack the bread was blackened too. How on earth could this have happened? I need to introduce you to my pride and joy – our range cooker. I’d bought it when I moved into the house five years ago. It was just before Lena’s Alzheimers diagnosis, but by that time she hadn’t cooked for a couple of years and the kitchen was my domain. I love my food and my cooking so I decided to splash out on a double oven. Now at last I had enough space to prepare all those Swedish-style specialities for our big family events. Or, with two different oven temperatures, I could bake my favourite old-fashioned desserts right alongside the main course. The safety features were important in my choice too: even then I knew it was going to be important to have a cooker that was muddle- and memory-proof. While the ovens were electric, the hob was gas. But to fire up a gas-ring, you needed to simultaneously press an ignition button with your right hand while turning and pressing in the ring control knob with your left. This kind of coordination was already beyond Lena. If you just turned on the gas without igniting it, the supply was quickly cut off. The same with the glass lid down: no gas. Accident-proof, I thought. Until now. What I hadn’t taken into account was the plate-warmer to the right of the hob, a feature I’d used maybe twice in five years. It’s a ceramic surface, electrically powered – and I know now that it can be turned on even when the cooker lid is down. Looking at the charred bread and the melted plastic, ‘warmer’ suddenly seemed a bit of an understatement! – Lena, did you turn this on? – You have to be careful, älskling. If you touch these knobs you could end up burning the whole kitchen down. – I know. I know. I know! She watched over my shoulder as I took a knife to the plastic smeared across the lid. But it’d have to wait. The glass was too hot. Ten minutes later, I had another go at it. A knife was no good. I could lift little shreds of plastic, but it would take forever. So I took a scourer to it instead, one of those little yellow pads with a green backing. And gradually, with a bit of effort, the lid was beginning to look better. How I came away from this unscathed, I don’t know. Lucky I was wearing my glasses. Lucky too that Lena by this time had lost interest and had drifted back to the front room. There were thousands of tiny glass granules all over the kitchen. 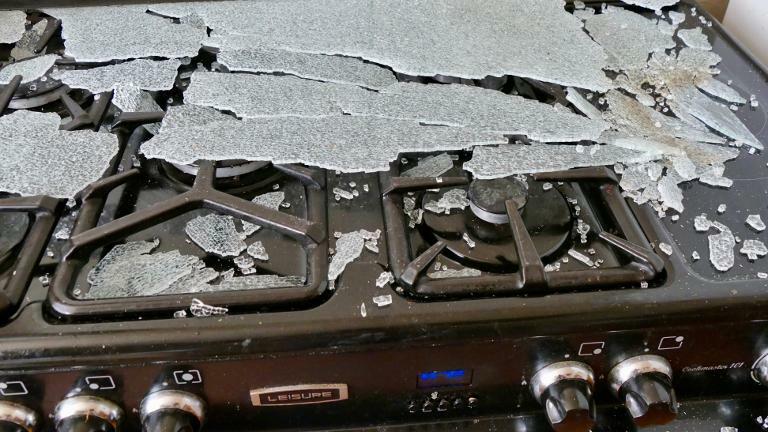 And as I carefully lifted each of the shards from the hobs, they disintegrated too. An hour later I’d finally got the kitchen cleaned up (although today, three weeks later, I’m still finding the odd glass fragment in nooks and crannies). So my next thought was how to rid our kitchen of dementia dangers. Because although you might forget a lot with dementia, I’ve learnt there’s one thing you always remember: how to create havoc. Without a doubt, Lena would be turning that plate-warmer knob on again in the next few days. There was no cooker lid to worry about now, but she could still easily burn herself. The red warning light had no meaning to her. The obvious solution was to turn off the electricity between uses. But the switch is hidden way down behind the cooker, out of reach. And the cooker is chained to the wall so that the gas supply can’t be disconnected. Time to call an electrician to install a new socket. Wonder if I should call the same genius who fitted the smoke alarm? Unsafe equipment and dementia is an explosive combination. But here’s the thing. Inadvertently, Lena had managed to expose four separate safety issues. It shouldn’t have been possible to turn the plate-warmer on with the cooker lid down. The cooker lid wasn’t heat-resistant. The smoke-alarm didn’t go off. Was it the wrong sort of smoke? The electricity socket for the oven was inaccessible. Does Lena have a future as a safety tester? Let’s put a more positive spin on it. What if the designers of self-driving cars came up with a means of transportation that could take even people with advanced dementia safely from place to place? As a learning exercise, incorporating the same safety and automation features into the vehicles they designed for the rest of us, might there not be huge benefits? Who knows? Perhaps they’re already working on it. Further thoughts It's not just about safety. The same principle - looking at the world from a dementia perspective - can help lead to improvements in other areas too. For example, the clarity of our public signs. Here are some thoughts about signage from one of our readers, Howard, who is living with dementia himself. He's writing on his blog, When The Fog Lifts. ENJOY THE STORY? THEN I’D LOVE YOU TO SHARE IT. It’s too bad somebody hasn’t come up with a remote control or web based interface for such things as ovens and ranges. An “everything is absolutely turned off and can’t be turned on without this device” control. Children and animals are just as likely as dementia adults to find ways to cause disaster around kitchen appliances.